Well, it is the eve of the beginning of another new year. I approach this day with a love for reflecting on the past and a bit of trepidation for what I can promise myself can be accomplished in the new year. What kinds of promises should I be trying to make anyway? For most of us we make promises, in the form of new years resolutions, because we want to believe we have some- or even a lot- of control over the outcome of the promises we make. We decide what we need, how we will act and where it will lead us because of our promise. We may even choose to create a written timeline for what we promise, making it come and alive and real in our minds by sharing it with our friends and loved one’s. Or we might simply offer up our promises in silence to ourselves, crossing our fingers and hoping for change. Through any of these rituals of making a promise, the goal is the same- we are trying, in some way, to decide where and how THIS new year will lead us to better ourselves, our lives and create change. Yet, as I reflect back on 2007, in my own life, I see a lot more curve balls and few straight lines towards my own creative and entrepreneurial progress. Don’t misunderstand, life has offered me lots of growth and positive change, just not exactly where I thought it would come from. I have found it most often through chance, coincidence, or call it destiny, inside the people and ideas that have sprung into my life without warning, but that have most moved me. Ironically, it has largely not come from those places I have tried with all my planning and will to bring into being. While we might find solace in these promises we make to ourselves, as we herald in another new year, I think it might be best to find strength, instead, in reflecting on where life has offered us progress and follow it. Act on what you love. Do for whom and what you find yourself believing in ,and, if ever your heart stops believing- listen to it and stop doing. Think carefully about your life and plan it, but follow that which takes shape in your life organically and incorporate it into your plan. Now this is a promise I can make and keep. It needs no greater shape to hold everything I need. I trust in this promise to fill my life with the hope, progress and the positive changes I seek. My wish for you in 2008, is that this can be the promise you make, that will inspire and lead you towards the growth and change you seek, that while you may find challenging to always truthfully honor, you will find far easier than any other promise you have ever made on this day to keep. During the holidays we all receive lots of cards and well wishes. One particular card I received caught my attention and I thought I would share it with you. Well compared to what Christmas really is. It’s ours to seek, to find, to see, to make a difference. Life is not measured by seasonal sales, It doesn’t need derivatives to bring joy. If you want religion stay out of politics. If politics is important stay out of religion. And if you can’t lead, follow the best man. Seeking the wise is painful but our obligation, and our nature in this brief life is but to find joy. Make 2008 Real. Happy New Year. Click here to listen to Tryin’ to Make it Real. Compared to what? with Less McCann Vocal and Piano, Eddie Harris Tenor Sax, and others at the Montreaux Jazz Festival, Switerzland, June 1969. It happens about the same time every year- just about now. With less than a week to go before Christmas, I find myself wondering what does this all really mean? I run myself ragged and this year is no different. I always promise myself that I won’t and invariably it happens all the same. 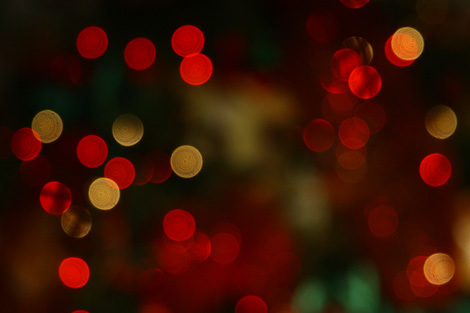 And still, that moment comes when all the orders have been filled, the chaotic schedule of holiday rehearsals have become a predictable schedule of performances, the tree has been decorated, the presents mostly bought, and, for a moment, I have perfect clarity. I love when this moment arrives because I never get tired of the awe I feel when I am able to look around the wrappings of my life and thank God for all the customers, clients, family, and friends in it that have blessed me. I wish for you a slice of heaven for the holidays. A number of moments of cheer and awe at the meaning of spending time with those you love and who love you. I wrote a post last week about The Kiva Organization titled Enriching a Nation. Here is a blog post by Guy Kawasaki reflecting on why The Kiva Organization is such a great business model. Given that Guy runs a venture capital firm, I found his perspective refreshing. Read his post here. 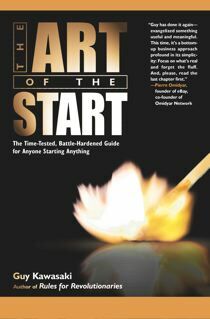 Guy Kawasaki also recently wrote a terrific book called Art of The Start. In The Art of the Start, author Guy Kawasaki helps people simplify the art of starting a new endeavor and avoid the potential pain of paralysis. His study of attitudes and people’s states of mind focuses on priorities and guidelines for doing rather than dreaming. 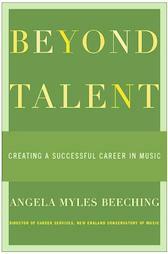 Published in 2005, Beyond Talent, written by veteran music career counselor Angela Myles Beeching offers up a comprehensive guide for musicians in search of work, demystifying the steps to success. Drawing on a wealth of real-life examples, the book untangles artist management and the recording industry and explains how tofind and create performance opportunities. Guidance is also provided on grant writing and fundraising, day jobs, freelancing, and how to manage money, time, and stress. Straightforward and reader-friendly, Beyond Talent is filled with practical tips, examples, checklists, sample budgets, goal-setting exercises, and extensive resource listings. This handbook goes beyond the usual “how-to”; Beyond Talent helps musicians tackle the core questions about career goals, defining success, and imagining and then creating a meaningful life as a professional musician. A couple of chapters of of Beyond Talent are available on line without a charge. Read it here. Jeff Cornwall, Director of The Center for Entrepreneurship at Belmont University, wrote this blog post as an introduction to a new book he is writing. Sounds like a great topic to explore. Jeff has a terrific blog The Entrepreneurial Mind. I am working over the break between our fall and spring semesters on a new book on bootstrapping. It is a text that is part of a new Entrepreneurship series from Prentice-Hall. It got me reflecting a bit on why bootstrapping is such an integral part of the entrepreneurial experience. It is worn by so many entrepreneurs as a badge of honor. They beam with pride when they tell of the creative way that they have gotten things accomplished for their business when operating on a shoestring budget. So why do so many entrepreneurs bootstrap their businesses? That is the question I ask at the beginning of the book. The answer to this question is not as simple as it might first appear. Some reasons for bootstrapping a business are borne out of necessity. Resource limitations are genuine constraint of many start-up businesses. The average start-up in the US only has about $10,000 in capital to launch their business. But in other instances, the entrepreneur makes a conscious choice to be a bootstrapper outside of resource limitations. Whether it be to improve the performance of their business or be it borne out of the values of the entrepreneur, sometimes bootstrapping is a conscious management style. Many entrepreneurs start out of resource limitations, but make the choice to make bootstrapping part of their culture. Over the next couple of weeks I thought it would be fun to blend my book writing and my blogging a bit. I will be making several posts reflecting on the various reasons entrepreneurs bootstrap. This week has been an exciting week of planning for 2008. A former student of mine, Andrew Favreau, who works for Edelman PR Agency in Chicago, shared with me the comprehensive public relations plan he has drafted for my book, The Bite-Size Arts Ensemble and for my work as an artistic entrepreneurial advocate and agent-for-change. The plan includes radio, print, hopefully some television, and of course speaking engagements. I have a couple of helping hands to shape and execute the plan. They include a small public relations agency, run by a former Edelman PR staff member who is a couple of years into running her own agency and will handle the daily/weekly/monthly plan, and a recent graduate in journalism, searching for her first opportunities writing as a freelance journalist. Getting press for your business venture can be very expensive. I have worked hard to find the best possible resources that I can afford to help get the word out about my book, speaking and performing. By working with two bright and talented individuals, one in a start-up venture and the other a recent graduate, I not only am offering each an opportunity, but I am able create a public relations campaign that without them, I would not be able to afford to execute at this level. The next few steps in this process will be to write a press release, which can be sent out once I have a publisher for my book, verify the data from a list of media contacts in the Midwest, New York and Los Angeles to begin to prospect for press, and continue to develop potential speaking engagements from a short list of relatively high profile schools, conferences and events, that still have openings for 2008. Next year will be an action pack year of continuing to build my blue bike. With each step I take, perfectly executed and planned or not, I feel more assured and more comfortable with not exactly knowing what will happen. What I do know is that building my business is a process of action– little steps- that eventually will cumulatively produce major growth, change and increased clarity. Simply by doing, even with parts of my blue bike still missing, including one of the most important- a publisher for my book- I know that this process of discovery is one of the greatest adventures of my life. What is it with Reality TV? More than thirty days have past since the writers’ strike took hold over TV’s programming. While many programs are in reruns, more and more reality TV seems to be popping up all over the airways. In search of new material, the networks have turned to, what they call, reality. NBC is bringing back “American Gladiators,” which will be hosted by Hulk Hogan. The FOX network will air a show called “When Women Rule the World” – what happens when suddenly men are made slaves to women living on an island. FOX has another show in the works called ‘Moment of Truth’. Participants will be hooked up to lie detector while being asked questions that might force them into sharing truthfully something embarrassing about themselves. How pathetic and sad that we, as a country, support watching people suffer for entertainment or sport. What kind of clear message are major networks sending the entire world about what it is that we are suppose to value? And why is there so much reality TV anyway? Well, first of all the strike has no effect on the writers/producers who work on reality shows because they are not members of the Writers Guild, even if they support it. Secondly, it offers the networks huge cost savings because a reality show costs on average 1 million dollars an hour to produce, versus other planned programming that can run between 2 and 8 million and hour. Can you spell greed, anyone? The scary part of all this, is that these time-filler shows launched by this strike could become permanent. When TV producers faced the last writer’s strike in 1988, they scrambled to come with alternative programming like “Cops” and “America’s Most Wanted.” Both are still going strong. While I find neither of these reality shows really offensive, the path that reality TV is now taking is yet one more hard reality of the lack of positive creative programming that too many of our largest networks offer to the public. How can we as a creative group change this? What GREAT creative reality programming can you think up? Something that can inspire the world and help others see a better way to laugh out loud in life, most every hour of every day, instead of shed a torrent of tears, fears and ‘can’t do it’s’. Thank God for Animal Planet, A&E The Food Network and Planet Earth. Want to know more about the strike? Read this NY Times article. Boy is Santa’s sleigh full of clarinets this year. Between speaking to parents who joyfully share about their budding musician, while standing in the bathroom with the shower running to place their order in secrecy, to parents calling with college age musicians needing to buy an “A” clarinet before college auditions, I, all of a sudden, have found myself working a full time job at the clarinet shop! What I love about the clarinet shop is all of the interesting wonderful families I speak to. I find the parents of these lucky musicians, who are about to get a new instrument, really interesting. I am encouraged and delighted to meet parents who are really interested in entrepreneurship and who want to know my thoughts on how to help their child create an interesting artistic life that economically makes sense. What is most encouraging, is that most of them truly believe that their child is creative enough, with a little help, to find a way to survive and thrive. How exciting! Times ARE changing. I can see the beginning of a real openness in young musicians and their parents to find new ways to flourish inside their creative interests and outside traditional career paths. Who knows what all these young clarinetists can create? Maybe one of them can create a way to “beam up” their new clarinet right into their house. These old fashioned boxes and wrapping materials just gotta go- they slow down Santa’s deliveries. But until then, time to get back to packing another sleigh. This amazing display of images change into weird and wonderful things. Sit back and enjoy the creativity. This video was put together by a young man in New Zealand who goes by ARSAP. You can download the pictures at www.arsap.co.nr. However, the images themselves came from designers who were featured through a site dedicated to various kinds of photoshop competitions: www.worth1000.com. Pretty clever business all by itself and a lot of fun to go and browse through. The music, in this video, is from Blue Man Group. Want to support an artist in your community? Do you believe in the arts as a way a nation can be transformed? The Kiva Organization offers an opportunity to change the world through developing all forms of expression into entrepreneurial ventures in third world countries. Through The Kiva Organization, you have the opportunity to sponsor an entrepreneur, in some of the poorest places in the world, through a micro loan. You can go to their site and read about a variety of individuals and their business ideas and choose who you wish to loan money to. Right now, all it takes is a $25.00 loan to begin to help that individual and, in time, besides being repaid, witness what a very small amount of money can do for their business. I would like to see the same kind of program offered in The United States for emerging entrepreneurial artists. While we as a nation have never known the kind of poverty really, as the countries The Kiva organization supports, as I see it, artists in The United States struggle, often, like the poorest in our country. Poverty is a downward spiral that offers little way out without financial support and education. Artists need far more of an education in financial management and micro-loan support to change their lives. Micro loans offer the kind of organic good will and just the right amount of financial backing to transform an idea into a reality. So many artists who have poor credit and are living hand to mouth could benefit. I can’t tell you her name, but I can tell you her life is falling apart. Or is it just about to really begin? Collection agents are calling her daily. She went to a homeless shelter for her last meal. Most of her clothes have holes. Going shopping means a trip to Goodwill. She usually counts the change she has in her wallet to scrape together, what she calls, “grocery money”. And yes, in her 30’s, this hand-to-mouth hard living keeps her up at night sick with worry. She is a musician- a very talented one. Low paying day-job by day, lower paying music jobs by night. She doesn’t do drugs or drink and is very careful with what little money she has from each pay check that does not go towards medical bills or her rent. Her family is dysfunctional- both verbally and physically abusive. One of her clearest family memories includes being punched in the face on her sisters wedding day, before walking down the aisle as the maid of honor. Thank God for makeup and the few hours it took for her black-eye to show. But the most destructive abuse is her own- the part of her that does not feel she deserves to have a life doing what she loves because she does not feel worthy. She suffers from very low self-esteem. Her inability to overcome her low self- esteem has given her the life that, in her mind up until now, she deserves. This is not new news. The blue angel has known for years, in her heart-of-hearts, that most everything in her life has to dramatically change to save her soul. She intellectually has understood it all. And yet her life, the one she herself describes as horrible, has been going on for years and years without one significant change- instead leaving her life filled with regrets. But what is new news is, for the very first time, she is willing to do whatever it takes to transform her situation so that she can emotionally and financially flourish. Just like peeling an onion, with tears streaming in plain view, she willingly is beginning to look at each layer of the dysfunction that has ruled her life, exposing all the pain that has lead her to a life of very low self-esteem. Now, nothing will stop her from moving her life in the positive direction she needs to grow her self-worth. Why? Because this time, unlike every other time, she will allow others to help her on her journey. I bear witness to her amazing progress because I am one of her helping hands. This Christmas, think about the blue angel and remember what I have told you about her. Why? Because next Christmas her life will be far from blue. This blue angel is about to learn how to change her blues into freedom. What might seem like a pretty desperate situation to you, is about to sprout wings. I met her by chance at a music gig. She is an amazing musician. What do the 12 Days of Christmas Cost? Every year bean counters come up with a figure of what the 12 Days of Christmas would actually cost the gift giver if you tallied up everything on the list. This year, buying every item mentioned in the carol, just once, will run you $19,507. Purchasing each item every time it is mentioned in the song means a lot more partridges in pear trees and $78,100 on your charge card ($128,886 if you avoid the crowds and order online.) Kind of makes that new clarinet you have been wanting for Christmas seem downright reasonable, doesn’t it? Shucks! You can likely even justify that new flat screen TV to watch when you are not practicing. But as an entrepreneur, I’m pretty sure I could turn the list into a profit center instead. School bands are a great source for affordable drummers drumming and there sure are a lot of them around. Check out where the pipers gather and here is an easy way to find eleven of them to play for a good deal. Of course your local dance studio has all the ladies dancing you will ever need and likely you can even find a few lords a leaping there too. And if you ask all of them to get together for a performance, this time of year, you can likely sell enough tickets to cover your costs and make a profit. God knows the concerts I have played lately have been to packed houses. Who doesn’t want to go to a concert this time of year? But instead of real birds, I’d do chocolate versions instead~my true love would not want to spend the rest of his year cleaning out birdcages. I found www.Davistudio.com surfing on-line. Check out Mary Anne Davis’ blog. I like her site and her attitude. This post titled, Making a living as an artist, (Jan 06) is well said. Enjoy. This is a tricky and difficult proposition. I can only speak from personal experience so here I go. Art school, undergraduate and graduate prepared me for nothing with regards to commerce. One valuable skin it helped me develop, though, was the skin for criticism. I’m not talking Art in America here. I’m talking about the day to day opinions of others about my work. Art school has weekly critiques, which prepares you, in a way, for others looking and commenting on your work, often brutally. So, that, I admit, is of value. Commerce, on the other hand, is far more brutal than mere opinion about what are your sources. Commerce requires that I be organized, have a product (art) that is clear, specific, well done and affectively communicated, not to mention ready to ship. And, selling my work is in a constant state of change. I lived in New York City for 15 years, had a studio in the meat packing district for 10 and was a star in graduate school. None of that helped me develop a presence in the art world. Maybe I was drinking too much, although that didn’t seem to hurt a lot of other artists (at least at the level of their careers). I think my timid attitude toward commerce, at that time, was counter productive toward my career. Artists with an eye to a career are called careerist, a very derogatory term. Hello! Who doesn’t want a career as an artist? What am doing here, making art that is above commerce? What’s that anyway. I hope my work will contribute to the expansion of culture in our society and in the global village, but I sure as hell can’t do even that if I can’t make a living doing my primary activity, making art. 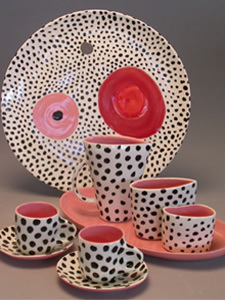 I have found a way to integrate my art into a living, which is in the development of a line of fine porcelain dinnerware. That is an aspect of my art. I also draw, paint and make totally useless (although mind bending) sculptures, but what I sell on a daily basis, to normal (maybe slightly above normal) income people is dinnerware. I have shown my work at craft shows and in a fair number of group shows in galleries and museums and even had a great show this past summer of 5 years of sculpture. I am still getting up every morning, now blogging first, then pulling myself away from my computer to mix clay, pour it into molds, fire it, glaze it and hopefully ship it. This requires I also spend a fair amount of time marketing it. Taking photographs, making catalogs and updating my web site. Oh yeah, mailing info to people, snail mail, email and word of mouth. I donate lots of work to good causes, mostly for silent auctions to raise money. Oh, and I also maintain a press list with editors who have published my work in the past and I do my best to keep them updated. Whew! That is a lot to do in a day. You know what though? I love it. I am passionate about it all to the point that I want to continue learning (major learning curve, all the time) and share what I have learned with others. Back to blogging. This seems like a good way to do that. No grants (I am a for profit org of one) , no VC (yet) and no academic institution to pay me a salary while I wax poetic. The leaves have been raked and are burning in the fire pit. From the fire, ringlets of smoke, like grey ghosts, drift across the lake. This morning seven ducks stood on the first layer of thin ice, proudly. sets the table for a perfect memory. Inside the fire roars as the smell of coffee awakens my senses. Time, for a moment, has stopped to fill me up again.